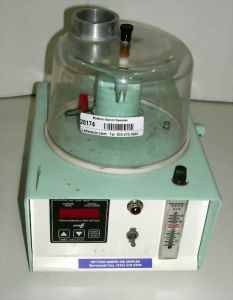 Product Description The design philosophy of the Mattson-Garvin 220 Sampler is based upon drawing air through a 0.152mm slit at 1-cubic foot/minute and impinging the particles contained therein upon an agar surface 2-3mm below the slit. The agar is contained in a commercially available 150mm x 15mm disposable culture plate which is rotated by a synchronous drive motor. The rate of rotation can be varied by the interchangeable drive motors. After sampling, the plate is incubated and the colonies counted. This count reflects the number of airborne particles carrying viable organisms. No dilution or plating steps are required. Results are expressed as viable particles per unit of air and a time-concentration relationship may be determined. The model 220 has a built-in vacuum pump.